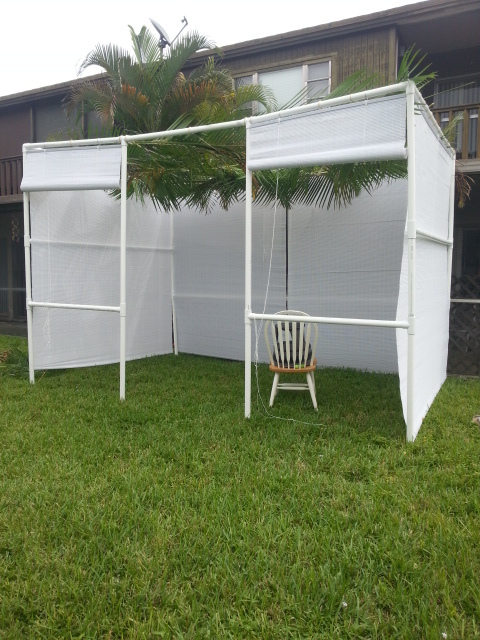 There is only one thing needed to build a sukkah – love! Love for God and love for man. It is that love that put together my first sukkah. Today’s post is more a photo journal, but since we know pictures speak volumes, I will let the photos do the talking. The love of my firstborn son for his mother prompted him to spend quite some time with me mulling over designs and varieties of materials. 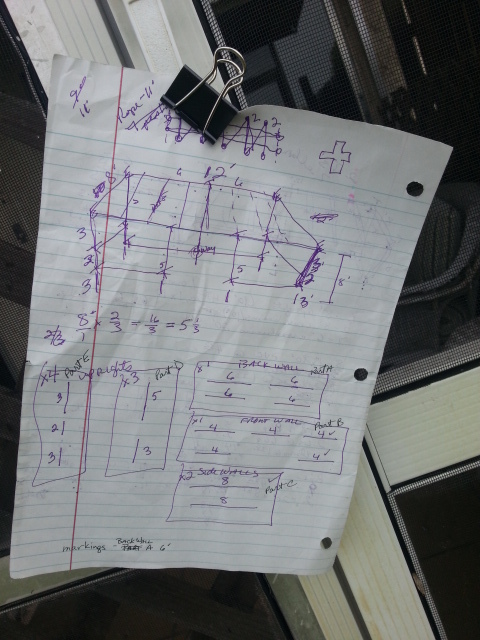 When I finally settled on a pvc structure, he ran out to his garage and shared with me a tool that saved my life. Okay, that’s an exaggeration, but it sure did save me hours of work hack-sawing away – not to mention thwarting an overused arm. The tool? 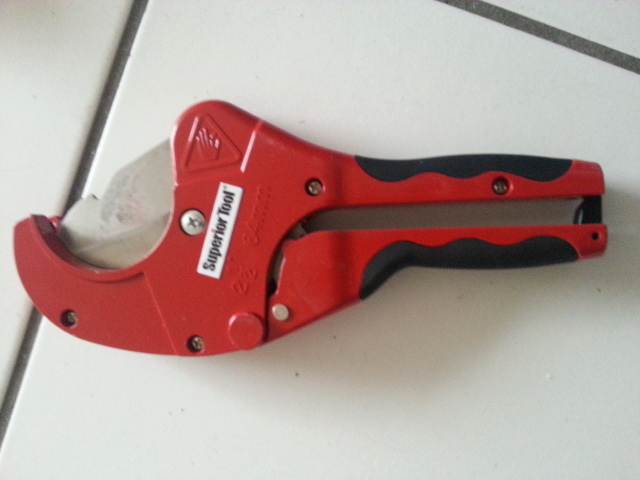 A racheting pvc cutter! Don’t leave home without it! Why? 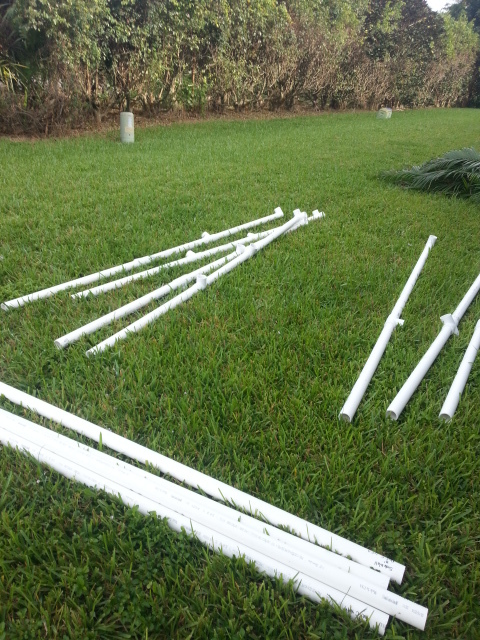 Because when building a sukkah out of pvc pipe, there are TONS of cuts to make. Okay, more exaggeration. There were only 31 cuts. 🙂 But can you imagine doing all that with a hack saw? Yuck! So with 31 cuts made, and each part marked for easy assembly this year (and years to come), I headed outdoors with plans in hand…or, more precisely, hanging on the doorknob for easy reference. I added the various connectors to the poles in order to set the upright units together. Next, I trimmed the palm bushes next to my porch, all the time praying that those pesky lizards wouldn’t jump on me! This whole time, I got to thinking, “Maybe it’s time to buy a ladder.” You see, my place is not that big, and I have very little storage and don’t need a ladder most of the year. But after going up and down my make-shift ladder hundreds of times – no exaggeration – I’m thinking it’s time. 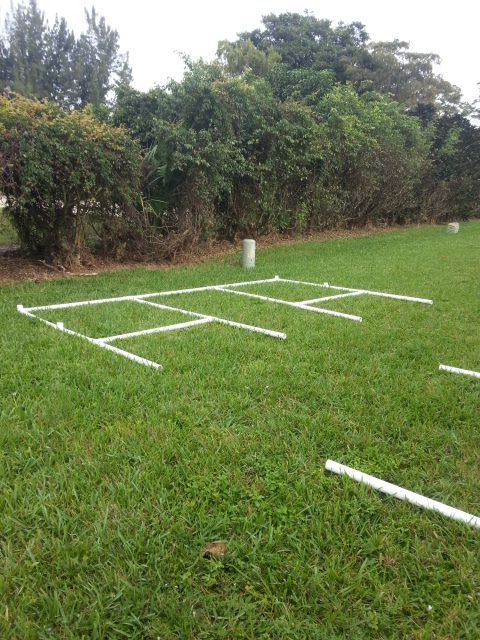 Next I assembled the back wall and inserted the side wall pipes. I was pretty pleased with myself, satisfied that things were going quickly. And then I realized I was putting this thing together on my own…one person…who can’t be in two places at once. This revelation came after I stood the back wall up, intending to lean it against the porch roof until I could bring the front wall to it. But did you know that pvc has a mind of its own? Well it does, and it kept insisting on leaning forward, not backward. What to do? As instructions and wisdom came from heaven, I was filled with joy once more. As hot and frustrated as I was at times, I was constantly reminded that I wasn’t alone. 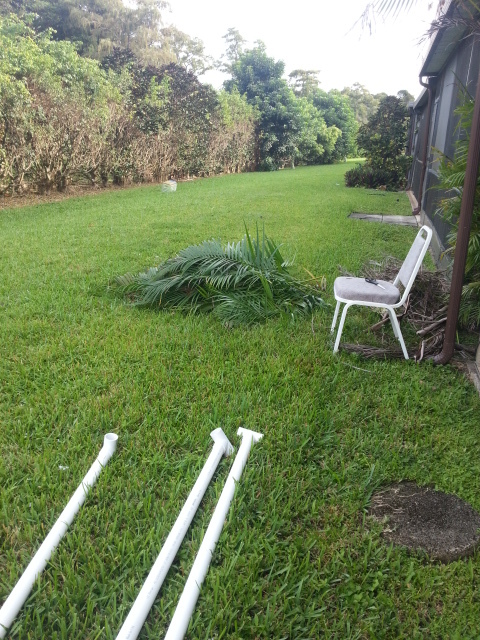 At every turn, at every struggle to climb my ‘ladder’, trim bushes while avoiding darting lizards, and fighting wobbly pvc walls, I couldn’t help but be filled with joy and giggling at each error I made and each correction my Abba gave. It was like He was right there with me, helping me build this temporary shelter full of love. So, I propped the side wall poles (that were still attached to the back wall) up on chairs. Then I took apart the front wall, attaching each upright to the side wall poles and voila! 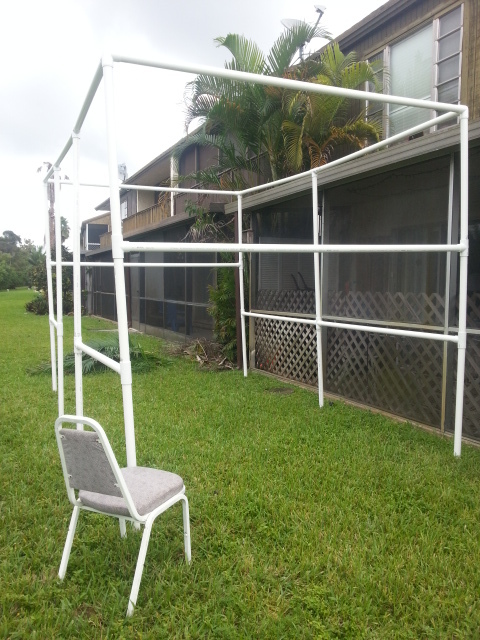 Sukkah assembled, praise God! 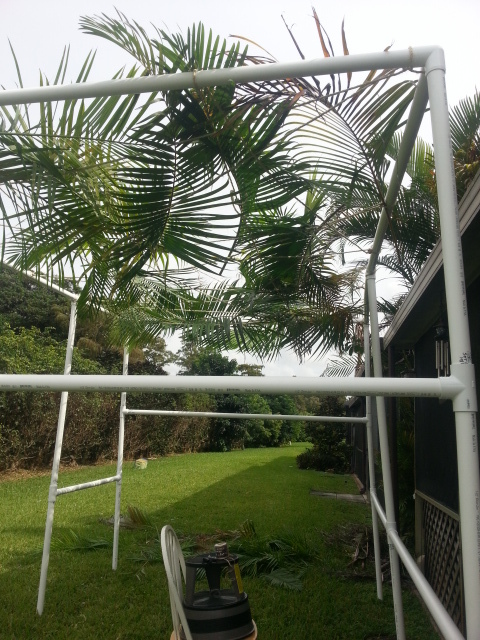 Next came the hundreds of trips up and down my ‘ladder’ as I tied rope back and forth to create a base for the palm branch roof. In hindsight, I think I’ll be adding some cross beams next year and possibly using fishing net as a base. The rope proved too flimsy to hold a lot of branches. In south Florida, the blast of the sun makes it very uncomfortable during breakfast and lunch. Speaking of the blaring heat of south Florida, I was quickly getting overheated. No matter how much water I drank, I could feel the strength draining out of me. With the skeleton of the sukkah assembled, I went inside for a rest. My face was bright pink! So heaven once more poured down wisdom and I took a cool cloth and wiped my face and neck, realizing it was time for a nap. 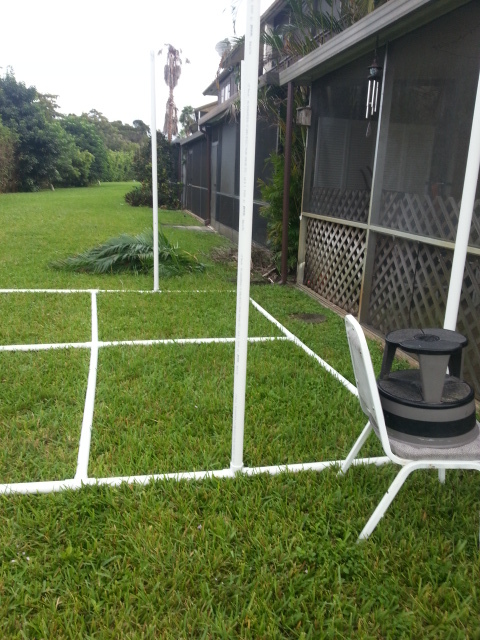 The final step in putting this sukkah together was to add the walls. 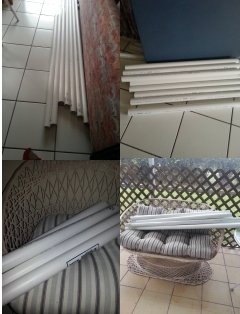 Using metal shower curtain hooks, I attached 8′ long roll up shades of various widths. All this took about 7 hours. I’m thinking next year, with a proper ladder and the pipes already cut, it should take less time. But here’s the thing that tickled me most of all. As the skeleton was assembled, the roof on, and the walls going up, a neighbor passed by and called out “Chag Sameach!” That one greeting, rejuvenated me more than all the water or naps could. You see, the joy of the season flooded my heart, knowing I was part of a bigger family, one that I didn’t even know. But we were connected through our Father as we all participate in His appointed times. Chag Sameach! May the joy of this season fill your heart, mind and soul as we celebrate Messiah tabernacling with us! Enjoyed your post! It’s about that time again! Happy Sukkot building! Blessings! Thanks Tammy! It sure is. I’ll be our there tomorrow bright and early.